Some see straight teeth, we see confidence off the scale. At Total Orthodontics in Taranaki, we realise that technology is powerful and useful for creating world-class smiles. Today we use digital imaging to help us identify problems, explain findings and improve treatment outcomes. There are also a number of 'tools of the trade' that may be recommended as part of your treatment plan. 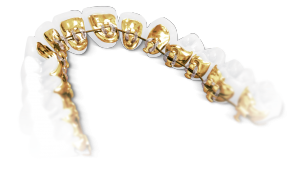 Julian is a certified provider of Invisalign® - a discreet alternative to braces. Invisalign® takes a modern approach to straightening teeth, using a custom-made series of aligners created entirely for you. These aligners are made of smooth, comfortable and virtually invisible plastic that you simply wear over your teeth. Wearing the aligners will gradually and gently shift your teeth into place, based on the exact movements your dentist or orthodontist plans out for you. There are no metal brackets to attach and no wires to tighten. You simply pop in a new set of aligners approximately every two weeks, until your treatment is complete and you achieve the confident smile that you’ve always wanted. The best part about the whole process is that most people won’t even know you’re straightening your teeth. One of the great advantages of Invisalign® is that you can remove the aligners for an important event and if you travel a lot, you do not need to worry about the chance of a breakage while you are away. If you are interested in orthodontics but do not want to have fixed braces, contact us to make an appointment for your assessment. An advanced generation of hidden braces that are attached to the back of the teeth, rather than the front like conventional braces. 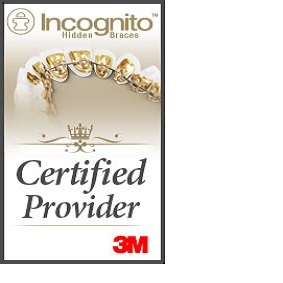 Incognito braces allow people to go about their daily routine without feeling self-conscious because their braces are virtually undetectable. Suitable for all age groups - children, teenagers and adults – each bracket is custom made using the latest in digital technology to maximise comfort and results for each patient. We strongly recommend that you wear your retainers on an on-going basis to give your teeth every chance of remaining straight. To make it as hassle free as possible we suggest you find a time that best suits you. This might be every night, one night a week, at weekends or just when you are at home. How often you wear your retainer will be advised by us and need to be gauged by you as there is no one size fits all recommendation. As a rule of thumb, if your retainers feel tight or you can see or feel that individual teeth are moving, then you should increase the times that you wear your retainers. Because your teeth and gums continue to change as you age, without retainers they may not remain straight. So the longer you wear your retainers the more likely you will be to retain straight teeth. What if I have a fixed retainer? The same principle applies. In other words the longer the fixed retainer is left in place, the greater the chances of those particular teeth remaining straight. It is also really important that you keep your fixed retainer clear of plaque with regular tooth brushing and to remind your dentist to check the condition of the retainer from time to time during your regular dental check-ups. If you require replacement retainers in the future, please contact us. A charge will apply for either replacement removable or fixed retainers. Powerscope and Forsus Springs are used to correct bite alignment, overjet, overbite, missing tooth spaces and to align centerlines. They are easy to wear and often allow for greatly reduced treatment times without the need to extract any teeth. Consisting of two blocks – an upper and a lower - it fits neatly into the teeth and positions the lower jaw into a more forward position to help correct jaw and teeth development. Twin blocks are also known as functional appliances. The beauty of the Twin Blocks is that it is very simple to fit and wear. While a child is still growing it is possible to improve the width of the upper jaw and the archform that the teeth make using fixed or removable expanders depending on the nature of the issue. Promoting jaw expansion through the use of expanders will often correct cross-bites, allow more space for erupting teeth, overcome crowding and improve the appearance of the smile. Best of all they are easy to wear and won’t create any discomfort.